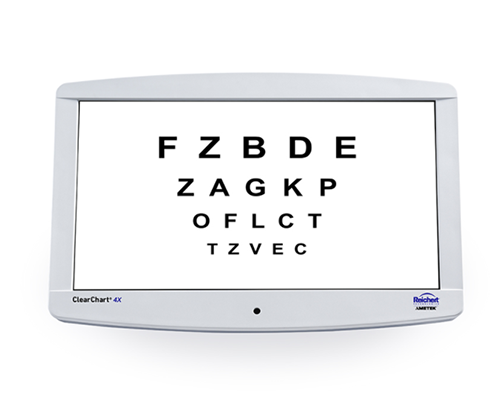 Phoroptor® VRx = FREE ClearChart® 4! • ClearChart 4 Digital Acuity System FREE at no additional cost. The Phoroptor VRx system works seamlessly with Reichert pre-test equipment, and the more you buy, the more you save! Increase efficiency and patient throughput with the SightChek™ Digital Phoroptor®. Bring the power of digital refraction to your practice for less. $500 Digital Acuity Chart Trade-in! Trade in your ClearChart 2 and get $750 towards a new ClearChart 4 Digital Acuity System or $1000 toward a new ClearChart 4X Digital Acuity System or ClearChart 4P Digital Acuity System. Offer valid in USA and Canada. Purchase a new LensChek Pro and receive a $100 rebate. The Reichert LensChek Pro has all the features of the LensChek Plus, with the ability to measure UV transmittance, measure PD, and auto-detect left and right lenses. Trade-in ANY make or model of non-contact tonometer towards a new Reichert® 7CR Auto Tonometer + Corneal Response Technology® and receive a $500 trade-in discount. The Reichert 7CR utilizes a patented process to obtain a Corneal Compensated IOP (IOPcc) measurement, which is a better indicator of glaucoma risk than other methods of tonometry, including Goldmann Applanation. Rest assured you are getting the truest IOP reading with the Reichert 7CR. $750 Off an Ocular Response Analyzer® G3!! Trade-in a first generation Ocular Response Analyzer® towards a new Ocular Response Analyzer® G3 and receive a $750 trade-in discount. Make a more confident glaucoma risk assessment, with Corneal Hysteresis. 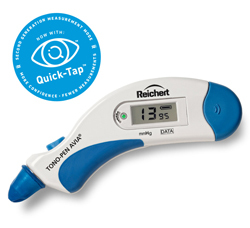 Only Ocular Response Analyzer® G3 from Reichert® measures Corneal Hysteresis (CH), a superior predictor of glaucoma, and helps add clarity to your glaucoma decision making process. CPT Code 92145, was published for the Corneal Hysteresis measurement provided by Ocular Response Analyzer. The Ocular Response Analyzer G3 is a sleek and compact, all-in-one device that does not need a separate stand-alone computer. Seamlessly measure patients and transfer data to your EMR from one instrument, while taking up a smaller footprint in your office. Same great technology, one compact solution. $750 Off a new Model 30™ Pneumatonometer! Trade-in ANY Model 30 Pneumatonometer towards a new Model 30 Pneumatonometer and receive a $750 trade-in discount. Doctors and technicians agree that the Model 30 Pneumatonometer is easy to use. The all-new touch screen interface features an intuitive icon-based operating system enabling even inexperienced users to make measurements in seconds. Trade-in ANY handheld tonometer towards a new Tono-Pen AVIA® and receive a trade-in discount. Contact us for details. The new Tono-Pen AVIA® with Quick-Tap™ technology makes taking accurate readings, quicker and easier than ever before. The handheld tonometer you’ve always trusted, can now get a reliable IOP reading in as few as two taps! Pachymeter Trade-In Offer - $300 Off iPac! 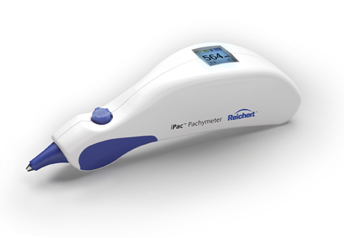 Trade-in ANY make or model of pachymeter towards a new Reichert® iPac® Handheld Pachymeter and receive a $300 trade-in discount. The Reichert iPac has a comprehensive set of features and elegant, ergonomic design. Its rechargeable lithium-ion battery, Bluetooth wireless data transmission, and 3-year warranty are just some of the reasons why iPac has become the most desirable handheld pachymeter available.